The movements of the sword form are beautiful and graceful and the footwork is very pliable. Sword displays strength and softness, appearing and disappearing and is flowing and ever changing. When the mind and energy are integrated the energy mobilises the body to transport the sword. The energy, the body and the sword become an integrated whole. 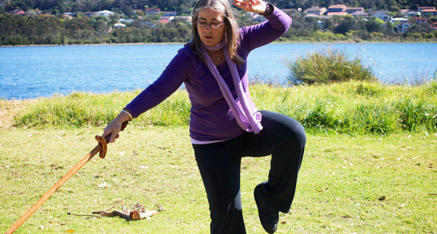 Tai Chi Sword movements are natural and smooth and it is said that the sword is like a swimming dragon. When the body movement is perfected the sword form is like a flowing river to heaven, so artistic, emotionally fulfilling and healing as it generates energy to flow in the right direction regenerating the vital organs. The practitioner can experience wonder and joy through the poetic mystery of the sword.